Summer is vacation time. We’re starting to plan our vacation and I can’t wait to go! This year won’t be anything elaborate, no RV trips, no river rafting, no Disneyland or Vegas, baby. In fact it will be the first time in over twenty years that my husband and I will have our own private getaway without kids (not counting one ill-fated night in Walla Walla, WA. Just a word of warning, eat before you do the wine tasting rounds). I think vacations or at least small getaways are essential breaks in our routine lives. They give us a chance to expand our minds, re-energize, and revitalize ourselves. They restore our sanity. They should be mandatory. Whether you are planning a big, expensive trip, or maybe just camping close by, I hope you have a wonderful, memorable vacation! In the meantime, here is a book that may awaken the travel bug in you. 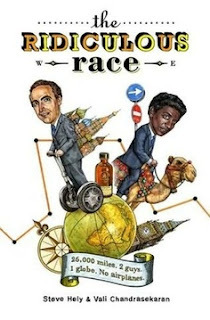 The Ridiculous Race by Steve Hely and Vali Chandrasekaran is a funny memoir about two men racing each other around the world. It’s a bet to see who can circle the globe the fastest—without the use of airplanes. The prize: A bottle of the best Scotch (Kinclaith, 1969). The competitors: Two television comedy writers. The year: 2007. The outcome: Hilarious! The starting point is Los Angles and Steve heads west while Vali heads east. This book is their outrageous travelogue noting their separate adventures in Mexico, China, Brazil, England, France, Ulaanbaatar, Germany, Russia, Sweden, Egypt, Italy, and more. They try new things: Segway tour through Paris, ride a horse in Mongolia, ride on the Trans-Siberian railroad, four-wheel in Dubai. And of course, they try new food. Steve tried duck in China. Maybe he should have skipped that one. One memorable moment in the book (and there were many) was when Steve got sick attending an opera in Peking. Imagine, such a once-in-a-lifetime experience and here he is in the bathroom “in a frenzied head-shaking hurricane of violent vomiting.” I smiled and laughed my way around the world with these two jokers. So did my husband. We both gave it a thumbs-up for a ridiculously fun read. Ordinarily, I make it a rule not to eat: Sea monsters of unknown phyla; things with eyes that stare back at me accusingly; limbless, tube-shaped creatures; anything cooked within five feet of an overflowing toilet. But on my second morning in China I ate all these things because of a brewery tour. (Steve) Steve Hely and Vali Chandrasekaran, The Ridiculous Race (New York: Henry Holt and Co, LLC., 2008), 75. To get a worse seat than I did one would probably have to have several open and bubbling wounds. (Vali trying to see the most famous belly dancer in Cairo) Steve Hely and Vali Chandrasekaran . “The Ridiculous Race” (Henry Holt and Co, LLC., 2008), 218. The pyramids are crazily awesome to behold. They’re amazing. And hordes of Egyptian hustlers do their best to ruin the experience. (Vali) Steve Hely and Vali Chandrasekaran . “The Ridiculous Race” (Henry Holt and Co, LLC., 2008), 196.